This is my second year playing fantasy football and first year doing an auction draft. Being new to the format, I figured this was a perfect chance to study up and walk away with a dominant team. Here is how I prepared for and executed my fantasy football auction draft. First off lets talk league scoring so those of you that know what I’m talking about have context. 12 teams. QB, RB, RB, WR, WR, RB/WR/TE, TE, K, D, BN, BN, BN, BN. 13 players each including the 4 bench spots. Touchdowns are 6 points, missed FGs are -1, .1 pt per yard returning, no PPR. The small bench means we’re going to have an active waiver wire so I wasn’t concerned with grabbing a bunch of sleepers. 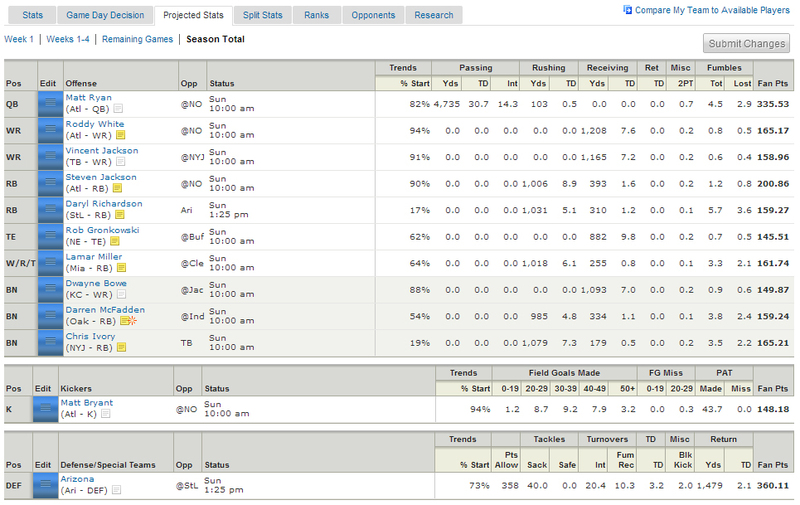 Here is the team I ended up with. I did a few practice drafts and a bit of reading before settling on a strategy. This being the first time anyone in our league had done an auction, I knew I needed to play it by ear and be willing to adjust my strategy on the fly. We could end up with an auction that started out heavy with everyone spending all of their money, or people might be timid and not willing to spend a lot for players right out of the gate. After a few practice auctions I realized that my success in the draft was going to come down to three factors: the prices I set for myself ahead of time, how I reacted to the draft & how I affected the draft. The first thing I learned about auctions is that points don’t matter, delta over baseline does. I had been thinking about the fact that there was some relationship of points to auction dollars such that if you followed the equation, no matter what players you ended up with, your $200 would get you the same amount of points. If, hypothetically you could start with a team of 13 $1 players and then upgrade each position – there was some dollar amount for each player at which point spending another dollar on them would not return as much value as spending that dollar on another player. If then you knew what this line was, and were able to find people under it, you can draft a team with a higher point to dollar ratio. The main problem with all of this is that we don’t know the future outcome ahead of time. Football is especially tough to predict because of the limited sample size, high amount of variance and very real possibility of injury. I was planning on spending some time building out predictions, but realized that other people had probably already done this. If you read my blog often you’ll know I don’t like doing work that someone else has already done. So I decided to do some research. I found two sources that both seemed interesting. The first was a spreadsheet posted to r/fantasyfootball. It took the consensus predictions of player performance from a number of experts and applies custom league rules to it in order to figure out where the value line is. The second was another r/fantasyfootball find called the BeerSheets. The took a similar approach but used slightly different math to account for the fact that players get injured and have bye weeks. Combining those two data points helped me set my dollar values. I wanted to make sure I was aware of a few other things as well so on my cheatsheet I highlighted injured players in red and potential hidden gems in yellow. Neither of these would affect my bidding much as the prices had already accounted for that, but it would give me a heads up and save me from relying on my memory. Now that I had my prices set and had done a few practice rounds I recognized the importance of being nimble. I didn’t want to end up being upset after the draft that it hadn’t gone how I had planned. The two things I needed the most visibility into was how the draft was lining up to my expectations and how much of each position had been exhausted. 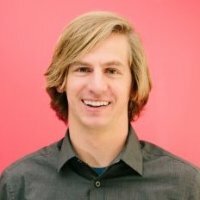 I ended up chatting with the creator of the spreadsheet I mentioned above and adding some suggestions – he built out something that was helpful, but I’d already built a version of my own. 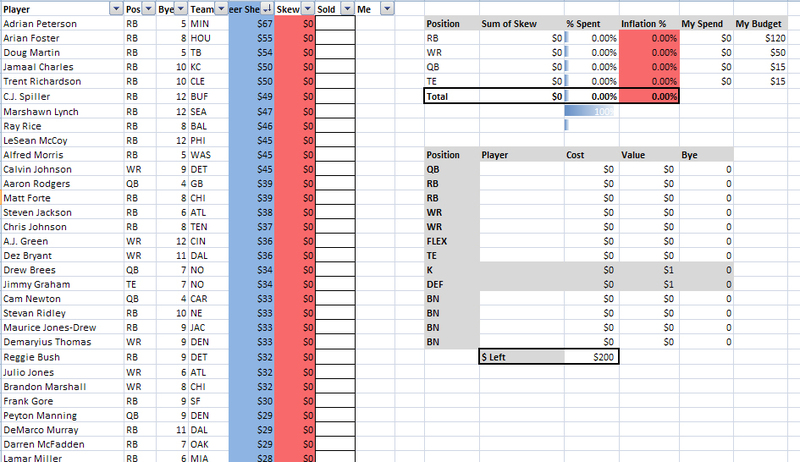 This spreadsheet would let me update the value that each player had sold for and the box in the top right would tell me how inflated the prices of those positions were and how much of that position had been exhausted. The idea was simple – there was a fixed amount of fake money in the draft, so if we started off high, we were going to have to come down again. Additionally, if I happened to be in a league where people favored one position, I could see which positions were not inflated and stock up on them, hoping to have trade bait for later. Here is a quick snapshot of how our draft went. Each image was taken after one round (12 picks). You might notice that the draft started off with a 21% inflation. Basically people were paying a lot for star players and it was obvious that no one else had really though about the relationship between dollars and baseline deltas. The first two rounds were so expensive that I didn’t pick up a single player until pick #25. Looking at the draft over time, here is the inflation of each round. Notice that the first two rounds were really expensive and then people started to worry about money. That is when I jumped on it and picked up Steven Jackson and Matt Ryan. Even with people bidding me up, round 3 was so timid that I got Matt Ryan for 40%of what Aaron Rodgers went for and nearly half of what Cam Newton did. The closest QB in price was Stafford. Below are the rounds I drafted players in. You’ll notice I got most of my players in round 6 where the prices were low because people were running out of money, but there were still good players left. Round 7 actually saw a spike because people were spending the last of their money to get the final starters. The final part of my strategy was to actively skew the draft in my favor. I did this inflating the price of players I didn’t want, starting bidding wars, taking advantage of people that hadn’t read the latest injury reports and strategically depleting budgets for positions where I wanted a value player. Typical aggressive market manipulation strategies. My basic goal was to make sure that no one got a deal on a player. Any money saved on one player could be used on another. I wanted to make sure that everyone spent the max they were willing to on every WR or RB. Every time they came up I would bid up to my max. Often a bidding war took it much higher, but even if not – it ensured we stayed at or above the value line early on in the draft. I was willing to take anyone at the right value so when a player was nominated I would wait cautiously to see if they were going to go for a low price. If so I’d quietly take them. If not I’d start mentioned everything good I knew about them and bidding. That usually resulted in a few people paying attention and helping get the price up. When it came to my nominations, I used them strategically to deplete budget at positions I didn’t plan on spending money at. With my first nomination I chose Colin Kaepernick. I live in SF so there are a lot of 49ers fans in my league. It worked like a charm, he sold for $41. I then continued to nominate every top 10 QB except Matt Ryan so that everyone would have a starter, hopefully stopping them from bidding on another top QB in case they somehow got stuck with 2 starting QBs. Peyton Manning went for $37 & Matthew Stafford for $20. If you look above at the inflation charts you’ll notice that by the end of round two, 90% of the budget I had estimated for QBs (and 70% of the actual end result) was already spent, meanwhile other positions were at less than 40%. This strategy worked perfectly – Matt Ryan at $22 was a steal. Next up in my plan was nominating injured players hoping people didn’t know. I had seen that Le’veon Bell had gotten injured but figured most people wouldn’t know and Yahoo’s system certainly wouldn’t have updated it’s price. Somehow there was a bidding war which resulted in a sale for $14. Turns out he’s going to miss the first month of the season and won’t likely be playing at 100% this year. I made sure to announce that – pretty sure the guy who got them was a bit shaken up. After that point people started to slow their bid anytime anyone mentioned sprained ankles or players missing practice. People were either too nervous to get caught by the same trick or too busy Googling it to see what the deal was. I tried to nominate Dustin Keller hoping I could pull it off twice but got stuck with him. It was a risk I was willing to take. He’s already been dropped from my team and replaced by a free agent. Homer defenses were also a big hit. Our league has a few Seattle fans – so Seattle’s defense went for $7 right after SF’s went for $5. I ended up with a team that has a lot of mediocre talent. It actually doesn’t look that great on paper because I don’t have any stars, but I feel really comfortable with it. The fact that my bench is projected almost the same as my starters means I’m less susceptible to injuries setting my team back and more able to trade. I also have 4 good running backs of which any one could have a breakout year. Update: I didn’t have a great season, but I think that had more to do with luck than this strategy. You can read my retrospective from after the season here.